A higher BMI is a well known risk factor for type-2 diabetes. The study followed participants until they were diagnosed with type-2 diabetes, pre-diabetes - where blood sugar levels are abnormally high - or the end of 2016, whichever came first. Over the study period, 1,067 new type-2 diabetes cases were diagnosed. Researchers found these people had had increased fasting blood sugar levels and insulin resistance, along with higher BMIs, up to 10 years before diagnosis. A similar pattern was observed in those who went on to develop pre-diabetes - the same kind of warning signs, albeit to a lesser degree, had been detectable more than a decade before they were diagnosed. Because most people who develop type-2 diabetes first go through a pre-diabetes stage, researchers say it means the warning signs of the condition may be detectable more than 20 years before an actual diagnosis. Dr Hiroyuki Sagesaka, from Aizawa Hospital in Matsumoto, Japan, who led the research, said: "Because trials of prevention in people with pre-diabetes seem to be less successful over long-term follow-up, we may need to intervene much earlier than the pre-diabetes stage to prevent progression to full blown diabetes. "A much earlier intervention trail, either drug or lifestyle-related, is warranted." Diabetes UK said about a million people in the UK were thought to have type-2 diabetes and not yet know it. But the charity points out that pre-diabetes does not have to develop into type-2 - people can usually make lifestyle changes to prevent this. Diabetes UK added: "Knowing your risk at any point in time is of course helpful in avoiding or preventing a diagnosis of type-2 diabetes. "Whether you're at increased risk of type-2 diabetes or not, everyone should be encouraged to live a healthier lifestyle by eating better and moving more." The research is being presented at the European Association for the Study of Diabetes conference and published in The Journal of Endocrine Society. 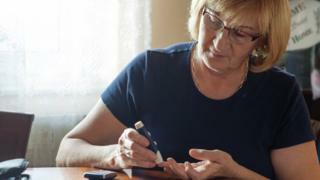 Separately, people who develop type-1 diabetes later in life are at risk of being misdiagnosed with the type-2 version of the disease, research suggests. This small study indicated 39% of people diagnosed with type-1 diabetes after the age of 30 were not immediately given insulin. Type-1 diabetics need to be given insulin immediately, while those with type-2 can often treat the condition by improving their diet and exercising more. Dr Nick Thomas, from the University of Exeter, who led the research, said: "Getting the right diagnosis is important for these patients to receive the right education and treatment."